Sword of Goujian - The earliest of the unique swords on this chart, the Sword of Goujian is truly a unique artifact. It comes from an era of Chinese history known as the Spring and Autumn Period. This was the period between ca. 771 and 476 B.C., marked by chaos within the Zhou Dynasty, taking its name from the Spring and Autumn Annals which chronicles this period. 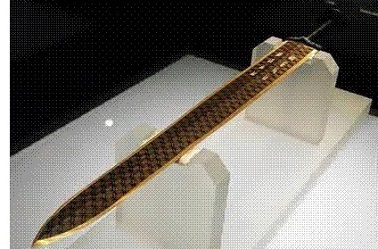 The sword was unearthed in 1965 during an archaeological dig in the Hubei Province. It was found in a near air-tight wooden scabbard finished with black lacquer. When it was unsheathed, an untarnished bronze blade was exposed with a still sharpened edge; despite being buried in damp conditions for 2500 years. On one side of the blade near the hilt are written eight characters, in ancient Chinese script, six of which have been identified. The script reads to the effect, "Sword of Goujian, King of Yue". The rest of the blade is decorated with rhombic etchings. Because of its remarkable condition, it was examined for its composition. It's considered a bronze sword, with an 80% copper content in the body to make it more pliable, and a 30% tin content at the edge to make it harder. Besides the bronze. there are also small amounts of iron, lead and sulfur in the sword. It's been determined that the sulfur is the agent that kept it untarnished for two and half thousand years (as well as the protection of the scabbard). How it was made is not known. It's about as famous in China as Excalibur is in the West.